The Williston Area Chamber of Commerce is an organization unified in its efforts to advocate on behalf of local businesses. We work to promote the interests of the business community, provide leadership on key commerce issues, and preserve the County’s quality of life. Through membership in the Chamber, you will have the opportunity to gain exposure for your business and take advantage of the many business services we provide. Benefits to becoming a member of this dynamic business organization are tangible and intangible, personal and professional. Below are some of the most important reasons for membership. The Williston Chamber of Commerce strives to promote member businesses and help them to stay strong and successful. 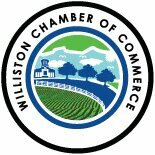 The Chamber is also dedicated to promoting the city of Williston and educating visitors and tourists about why we believe this is the best place to work, live and play. Each February the Chamber hosts its annual Installation Banquet and general membership meeting. This year, more than 70 business owners and their guests enjoyed a New Orleans-style Mardi Gras party with authentic NOLA cooking and entertainment. It’s the perfect opportunity to get acquainted with fellow business owners and network among the members. New businesses and Chamber members are welcomed to town by a ribbon cutting ceremony that is featured in the Williston Pioneer to let the community know about the business. The Chamber will be selecting a Business of the Month later this spring. The winning business will have a sign placed in front of the façade and will be featured in “The Chamber Corner” of the newspaper –more free publicity for you. Our website willistonfl.com is being revamped to ensure it’s member friendly. You will be able to post to a calendar of special events and you will have your own page/link within our website. The Chamber acts a marketing tool for you. Special events and promotions can be sent to the Chamber and in turn those are dispersed electronically to the membership. Those same events and promotions can be shared on social media, thereby giving you more exposure and saving you some time. The Chamber acts as a referral service for members. Dozens of calls are received each week from newcomers to the area asking for specific services and products. Members always get top priority when making these referrals. The Chamber welcomes your brochures, business cards and flyers for placement in our office. This enables Chamber visitors to select what they need when they come in. The Chamber will host a series of workshops led by experts in their field to teach members how to grow their business. The Chamber works with the city of Williston to recruit and sustain businesses. Buy Local is our motto. Please bring any promotional information you have for distribution to our office. This literature is placed in our racks at the Chamber office as well as other Chambers in North Central Florida. We include it in every package that we send to people interested in relocating to our area. With our fantastic new Board of Directors, the 2017 Williston Chamber of Commerce is teeming with ideas on how best we can make our Chamber one that promotes you, new businesses and the community of Williston. We’re open to ideas, suggestions and yes, even constructive criticism because how else can we be better, if we don’t know what we’re doing wrong? As the new director, I’d also welcome the opportunity to sit down, one-on-one, and chat with you about the direction of YOUR Chamber and what you’d like to see happen this year. Send me an email or give me a call and we’ll schedule a time that’s convenient for you. Don’t forget to send in your dues and remember, you can get a $25 discount if you will volunteer to help at either the Peanut Festival or Christmas Parade/Light Up Williston. Viewed by many as a source of pride and integrity! Display these decals prominently in your place of business to ensure that your visitors recognize you as a Chamber member. Get involved and be part of the most exciting events Williston has to offer. Bring your experience and knowledge onboard to assist in strengthening our membership. Just as the Chamber is important to our community, YOU are important to the Chamber. Your investment in the Chamber means an investment and commitment in the community. Full Members have the opportunity to earn $25 for every new member they refer with our New Membership Referral Program. Full Members can volunteer at Chamber hosted community events and get an additional $25 off their membership dues. New Full Members have the choice to pay their chamber dues in two installment payments of $75 during the year. Great for the business just getting started!